These general sales conditions apply strictly to all product sales made by ElectronicaRC. Any order made at ElectronicaRC necessarily involves an essential, decisive and indispensable, the unqualified acceptance by Customer of the General Sale Conditions in force on the day they perform the appropriate order. In addition, you acknowledge that the acceptance of these conditions involve the application of the order to which they refer, as well as any subsequent order, except for cases where new conditions are brought to its attention by ElectronicaRC. The fact that ElectronicaRC not recur at any given time these conditions can not be interpreted or equal to renounce recourse to them in the future or in the past. Applicable law and jurisdiction. The interpretation and enforcement of the conditions and all actions resulting from them are, shall be subject to Spanish law except as provisions contrary to this law enforcement. Published prices in ElectronicaRC are in Euros and US. All prices inclusive of VAT applicable on the date of the order, any change in VAT rate will be applied automatically to the prices of products sold in ElectronicaRC. The offers on products sold in ElectronicaRC be displayed on the product details and, if not otherwise stated, are valid while displayed on screen. Promotions from ElectronicaRC are valid within the indicated period. The products will correspond to the photographs, graphics and descriptions shown in the products website. 1.The products purchased will be delivered to the person and address listed on the order. 2.With default, invoices are sent to the email address specified by the customer at the time of his order at ElectronicaRC. 3.On Saturdays, Sundays and holidays there will be no shipped out and delivery orders. 4.This delay does not imply or cancel the order nor any compensation. 5.A order is considered delivered when the carrier delivers the package or packages and the customer signs the delivery receipt. The customer must check the products condition at receptions and indicate any anomalies on the delivery receipt at delivery time. You have the right to withdraw your purchase at ElectronicaRC within 14 calendar days without justification. The withdrawal period will expire on the 14 calendar days of the day that you or a third party appointed by you, other than the carrier, acquired the material possession of the goods. To exercise the right of withdrawal, you must notify us, ElectronicaRC, Fco. Javier Martinez Fernandez, C / Antonio Gomez Millan 13, Polig. Technique Citec 41120 Gelves (Seville), email: support@electronicarc.com, Tel: 655686985, Fax: 955439456, your decision to withdraw from the contract through an unequivocal statement (eg a letter sent by post, fax or mail electronic). You may use the form of withdrawal form below, although its use is not mandatory. In order to comply with the withdrawal period, it is sufficient that the communication regarding the exercise by him of this right be sent before the corresponding term expires. In case of withdrawal on your part, we will refund all payments received from you, including delivery costs (with the exception of the additional costs resulting from the choice of a delivery method different from the less expensive mode of delivery We offer) without undue delay and, in any case, no later than 14 calendar days from the date on which we are informed of your decision to desist from this contract. We will proceed to make such refund using the same payment method used by you for the initial transaction, unless you have expressly provided otherwise; In any case, will not incur any expenses as a result of the refund. We may retain the refund until you have received the goods, or until you have submitted proof of the return of the goods, depending on which condition is met first. You must return or deliver the goods directly to ElectronicaRC, Fco. Javier Martinez Fernandez, C / Antonio Gomez Millan 13, Polig. Tecnologico Citec, 4120 Gelves (Seville), without undue delay and, in any case, at the latest within 14 calendar days from the date you inform us of your decision to withdraw from the contract. The deadline will be considered fulfilled if the property is returned before the deadline has expired. You must assume the direct cost of returning the goods. You will only be responsible for the decrease in value of the goods resulting from manipulation other than that necessary to establish the nature, characteristics and operation of the goods. - For the attention of ElectronicaRC, Fco. Javier Martinez Fernandez, C / Antonio Gomez Millan 13, Polig. Citec, 41120 Gelves (Seville). Email: support@electronicarc.com, Fax: 955439456. 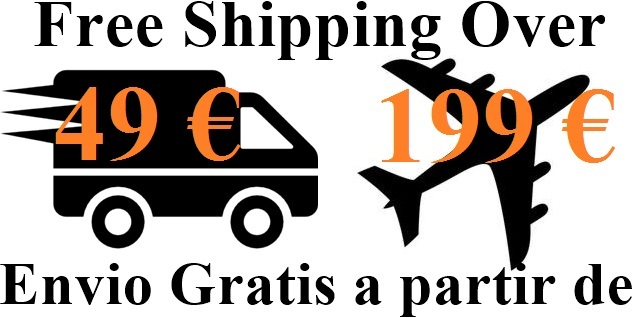 If you cancel the order arrives before the goods the customer does not have any expenses. In case of cancellation after the departure of the order, the customer will be responsible for the return costs of this same order. In acordance with RDL 1/2007, ElectronicaRC warrants all products sold for a period of 2 years from the date of purchase. Customer must take into account when reporting that a product is defective, that for the proper functioning of the product is essential to know if any perfectly and properly mounted, all according to your instructions. For any doubts you can contact ElectronicaRC. In particular it should be noted that any blow or shock received by the product as a result of the use to which it is intended can cause internal problems not detectable to the naked eye. Customer shall review, prior to assembly, the different pieces of the product are in perfect condition and, if not, contact ElectronicaRC as quickly as possible to proceed to solve the problem. • Damage caused by misuse or accident, as well as wear and tear. • Defects related to wanting to overcome the limitations given by the product specifications. • In relation to incidents of damage caused by transport: Customer must check the condition of the package received and, if detected an abnormality in it, include it on the delivery receipt that facilitates the transport agency or post office sign it. This step is essential in order to claim the insurance in case of damage caused by transportation. In not doing so, the Customer may waive any such claim. The Customer shall notify ElectronicaRC any mishap like this, to make appropriate representations to the transit agency and proceed with the replacement of the damaged product or individual pieces involved whenever possible. • If the Customer delivered checks received that does not match what you bought, or missing product or a part, you must notify as soon as possible and always within 14 working days, along with the order number. ElectronicaRC proceed to solving the problem at no cost to the customer. • If the Customer delivered verifies that a product does not work ElectronicaRC must notify within 15 days. ElectronnicaRC be responsible for removing the product without cost to the customer. Made the relevant checks, ElectronicaRC replace it with a new one, or will proceed to refund the amount, including shipping, if you do not have the same product. In either of the above cases, if after appropriate checks shows that the product contains no defects covered by the cases described, the product will be returned to the customer who bears the costs of return of the product. 07. Velcro 2 x 30 Cm.